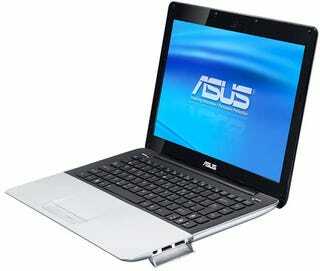 ASUS' Skinny UM30 Laptop Look Familiar, With That Aluminium Body and Black Bezel? A record for ASUS' laptop range, the UM30 measures just 19.6mm thick, and while there's nothing particularly special inside, we do happen to think it looks rather smart. You know, for an ASUS. Running on an Intel Core 2 Duo SU 9400 processor, there's 3GB DDR2 SDRAM and a 320GB HDD. Loaded with Windows 7 Home Premium, the LED-backlit TFT LCD screen is a portable 13.3-inches.